Can the beer ingredient treat insomnia and hot flashes? Hops are the flower of the hop plant (Humulus lupulus) used to make beer. In addition to imparting flavor to ales and pilsners, hops are also believed to offer health benefits. Many of these benefits are attributed to compounds found in the plant's artichoke-like flowers, including the flavonoids xanthohumol and 8-prenylnaringenin and the essential oils humulene and lupulone. Alternative practitioners believe that these compounds have anti-inflammatory, anti-anxiety, analgesic (pain-relieving), and even anti-cancer properties. Some of these claims are better supported by research than others. Hops have been used for well over 1,000 years to brew beer, but it has also been used since medieval times to produce medicine. Today, herbalists and supplements manufacturers claim that adding hops to a diet can improve your overall health and even prevent certain diseases. It was observed by early physicians that hops pickers tired very easily during the harvest. It was assumed by early physicians that a sticky resin excreted by the cut plant caused this effect. 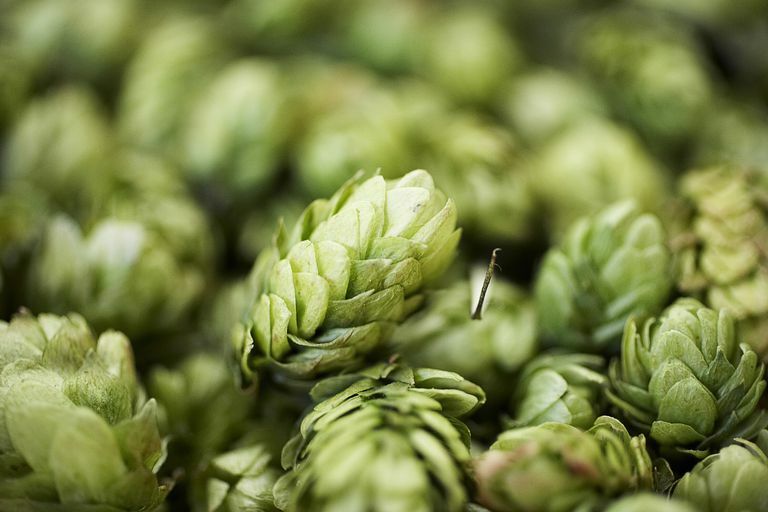 In recent years, scientists have confirmed that humulene and lupolene found in hops have mild sedative properties that may have applications in medicine. According to a 2010 review of studies from Australia, pairing hops with valerian may help treat insomnia. Of the16 reviewed studies, 12 found that the combination improved sleep quality and reduced the time it took to fall asleep. In some cases, this translated to 2.5 hours of additional sleep per night and a 50 percent decrease in the number of nighttime awakenings. These effects may be especially beneficial in people with rotating work shifts and may even prove useful in treating mild anxiety. The flavonoid 8-prenylnaringenin found in hops is classified as a phytoestrogen (a plant-based compound that mimics the activity of the female hormone estrogen). It is believed by some that 8-prenylnaringenin can help increase estrogenic activity in the body, overcoming symptoms of hypoestrogenism (estrogen deficiency). Since estrogen levels are known to drop during menopause, hops may help alleviate the hot flashes and night sweats that typically accompany the condition. According to a 2010 study from Finland, menopausal women provided an eight-week course of a hops extract experienced a reduction of hot flashes, night sweats, and even low libido compared to those provided a placebo. Atherosclerosis, often referred to the hardening of the arteries, is a condition in which the accumulation of plaque inside an artery can lead to a heart attack or stroke. The compound xanthohumol is believed to have anti-restenotic effects, meaning in that it can help relax blood vessels and improve blood circulation. A 2010 study from Japan found that mice fed a hops xanthohumol extract has significant increases in "good" high-density lipoprotein (HDL) cholesterol, corresponding to a decreased risk of atherosclerosis. Moreover, the increases were seen in a type of HDL rich in apolipoprotein E, a protein central to the metabolism of fat and prevention of cardiovascular disease. These same effects may benefit people with obesity by promoting weight loss, reducing abdominal fat, lowering blood pressure, and increasing insulin sensitivity, according to research from Oregon State University. There is little evidence that hops can directly prevent cancer. However, the compound xanthohumol appears to exert anti-cancer effects that may one day lead to the development of novel cancer therapies. According to 2018 review of studies from China, xanthohumol was able to kill certain types of cancer in test tube studies, including breast cancer, colon cancer, ovarian cancer, liver cancer, melanoma, leukemia, and non-small cell lung cancer. The flavonoid appears to do it in several ways. In some cases, xanthohumol was cytotoxic, meaning that it directly "poisons" and kill cancer cells (and, presumably, other cells around it). In other cases, it triggers apoptosis, also known as programmed cell death. Apoptosis is one of the main features that separate normal cells from cancerous ones. From the moment of conception, all cells undergo apoptosis at a certain point in their lives so that they can be replaced by healthy, new cells. Cancer occurs when a cell mutates and no longer undergoes apoptosis, allowing them to multiply without end. If scientists are able to identify how xanthohumol activate apoptosis in cancer cells, there may one day be a hops-derived drug able to reverse certain cancers. When taken for health purposes, hops supplements are believed to be safe with minimal side effects. Some people may experience tiredness; taking the drug just before bedtime usually helps minimize this symptom. Hops may also cause an allergic cross-reaction (generally with mild rash and congestion) in people who are allergic to birch pollen. It is not known at what dose hops supplements are beneficial or at what point they may be harmful. Hops supplements are generally offered in 300- to 500-milligram fomulations and are considered safe within this range. Most supplements are sold in capsule, tincture, or powder forms. Hops should be avoided in certain groups, including people with depression in whom hops may cause a worsening of symptoms. Due to their sedating effect, hops supplements should be stopped two weeks before surgery as they may amplify the effects of the anesthesia. It is for this same reason that you should avoid taking hops with alcohol, sleeping pills, or other central nervous system depressants. People with estrogen-dependent conditions, including endometriosis, gynecomastia, and certain types of breast cancer, should avoid hops due to their estrogen-like activity. Dietary supplements are not required to undergo the rigorous testing and research that pharmaceutical drugs do. For this reason, the quality of supplements can vary from one brand to the next. To ensure quality and safety, only choose supplements from reliable, well-known manufacturers. While many vitamin manufacturers will voluntarily submit their supplements for quality testing by an independent certifying body (like the U.S. Pharmacopeia (USP) and ConsumerLab), the practice is less common among herbal supplements manufacturers. Irrespective of the brand you choose, keep in mind that the safety of supplements in pregnant women, nursing mothers, and children has not been established. Does beer have medicinal properties? It is hard to recommend beer for the treatment of any medical condition. While some doctors will endorse a daily glass of red wine to reduce your risk of heart disease, there is no data to suggest that beer has the same benefit. According to the aforementioned study from the Oregon State University, you would need to drink no less than 3,500 pints of beer to achieve the purported health benefits. Can you use fresh hops instead of supplements? Fresh-off-the-vine hops are harder to find outside of growing regions. If you are able to get some, you can use them to flavor teas or add a bitter, citrus-y note to certain foods like custard, ice cream, and meat marinades. On their own, hops are pretty unpalatable and difficult to digest. But when infused into food, they impart a flavor that many people find appealing (and, presumably, many of the flavonoids and essential oils beneficial to your health). Hops can also be purchased as dried pellets or leaves for home beer brewing. To make a tasty hops iced tea, add ½ ounce of dried hops to one cup of water and one cup of sugar. Bring these to a boil and let steep for 10 minutes. When cooled, add up to 2 liters (½ gallon) of lemonade with ice and serve. Erkkola, R.; Vervarcke, S.; and Vansteelandt. S. A randomized, double-blind, placebo-controlled, cross-over pilot study on the use of a standardized hop extract to alleviate menopausal discomforts. Phytomedicine. 2010 May;17(6):389-96. DOI: 10.1016/j.phymed.2010.01.007. Hirata, H.; Segawa, S.; Ozaki, M. et al. Xanthohumol Prevents Atherosclerosis by Reducing Arterial Cholesterol Content via CETP and Apolipoprotein E in CETP-Transgenic Mice. PLoS One. 2012;7(11):e49415. DOI: 10.1371/journal.pone.0049415. Jiang, C.; Sun, T.; Xiang, D. et al. Anticancer Activity and Mechanism of Xanthohumol: A Prenylated Flavonoid From Hops (Humulus lupulus L.) Front Pharmacol. 2018;9:530. DOI: 10.3389/fphar.2018.00530. Miranda, C.; Johnson, L.; Montgolfier, O. et al. Non-estrogenic Xanthohumol Derivatives Mitigate Insulin Resistance and Cognitive Impairment in High-Fat Diet-induced Obese Mice. Sci Rep. 2018;8:613. DOI: 10.1038/s41598-017-18992-6. Salter, S. and Brownie, S. Treating Primary Insomnia - the Efficacy of Valerian and Hops.​ Aust Fam Physician. 2010 Jun;39(6):433-7.